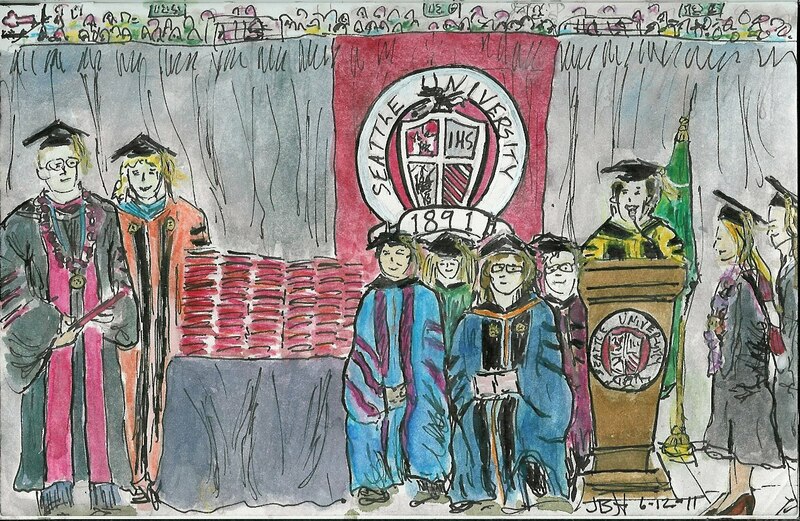 I sat all day on Sunday at the Seattle U graduation at the Key Arena. This is my 18th commencement ceremony so thought I'd try something different. I've been inspired watching some of the Seattle Urban sketchers drawing fast moving objects -- Gail's sketch of the view of Seattle from the ferry, Gabi's Seattle Mariner's and little league games, Steve's Rat City Roller Derby sketch so thought I'd get some practice sketching moving objects while watching the grad ceremonies. 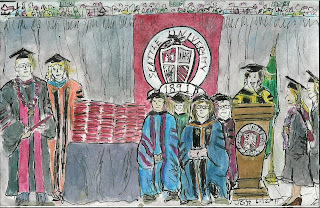 I had a hard time with this and really wanted to draw one of the graduates walking across the stage but couldnt sketch that fast (tips are welcome!). One of the students said, as she was walking up to the stage, "Look she's coloring!" I really was paying attention (probably more attention than usual while doing the sketch). I always enjoy watching students graduate. Congrats 2011 SU Grads!